In my previous article, I talked about how the many organic variables involved in playing golf make it a lot like trying to navigate business relationships. The article struck a chord with many readers and I heard from several avid golfers who suggested more ways in which the two are similar. So it’s time for the sequel, with three more ways business relationships are like playing golf. Of course, the goal of golf is to get the ball in the hole. But one of the ironies of the game is that the vast majority of golf shots are in fact aimed elsewhere. Shots off the tee are usually aimed at the fairway. Approach shots are focused on getting the ball closer to the green or onto the green itself. And even some putts are from far enough away that the goal is to just get the ball close to the hole to make the next putt easier. Now, if one of those shots accidentally goes in, it’s cause for celebration. Holes-in-one are rare and joyful events. But many shots in golf have no chance of going into the hole because they are not aimed anywhere near it. Instead, they are aimed at putting the player in a better position for the next shot. If you think of playing golf as analogous to developing and nurturing business relationships, getting the ball in the hole would equate to making a sale. And what we can learn from golf is that, just as every shot is not aimed directly at the hole, every interaction in relationships should not be aimed at making a sale. The majority of interactions in business relationships should instead focus on putting the businessperson in a better position for the next interaction. Just as some relationships take longer to develop, some golf holes are longer than others. Par-5 holes are 67 percent longer (in terms of number of strokes) than par 3s. This is why golfers carry so many different clubs. Big drivers that get used off the tee on a par-5 hole aren’t even touched on a short par 3. So even though the goal is the same (get the ball in the hole), the necessary tools and techniques are very different. In business, sometimes it just takes longer to build a relationship with one person compared to another. And we find that often, the bigger the potential value of that relationship, the longer it will take. 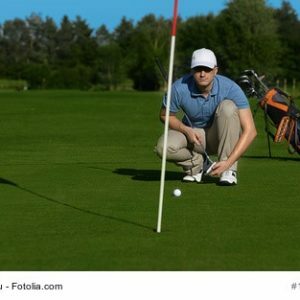 Plus, not only does it take longer, it can require different kinds of relationship-building techniques and tools (just like longer golf holes require different clubs). Be certain, therefore, to have a mix of activities “in your bag” to utilize for different types of relationships. Other than sports where you’re trying to hit a person (boxing, MMA, dodgeball), I can’t think of any other major sport where the goal (or target or end zone or basket) is moved from place to place. In golf, though, the hole is moved to different locations on the green on a regular basis (and in between each daily round during professional tournaments). This helps to keep the greens from wearing out from too much traffic in one spot but also adds to the complexity of the game since the same course will present different challenges as the holes are relocated to different places on the greens. It also provides a perfect analogy for business relationships. Even with all the planning in the world, sometimes the goal moves. People get fired, new bosses are hired, and business goals change. It can be very frustrating when you think you are on track, only to find out the destination is no longer where you thought it was. The key is to make sure you have flexibility built into your relationship development and nurturing process. If your system is too rigid, it will not be able to accommodate the changes that are guaranteed to occur. Let me know if I can help with any aspect of your business relationship process, and here’s hoping you get that ball in the hole no matter where they place it!